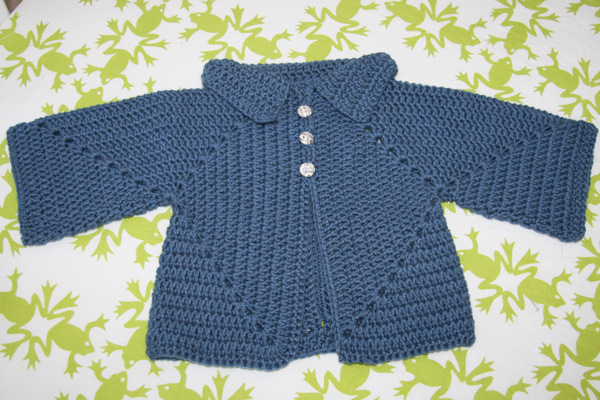 Anyway, not too long after leaving a comment on Kate’s post, she generously offered to make up one of these wonderful little cardigans for the new baby. It arrived recently, and I can’t even begin to tell you how much I love this one – it’s made of the most gorgeously soft yarn in this perfect blue color with fabulous little buttons. I just can’t wait to see the new baby in this sweater!! Thank you so much Kate! This one will be treasured forever. In return, I made up a few household goods for Kate. I spent some time browsing her flickr photostream and favorites and noticed lots of projects in shades of blues, which I’m hoping means it’s a favorite color. I pulled out a few of my favorites and chopped them up into tiny squares. 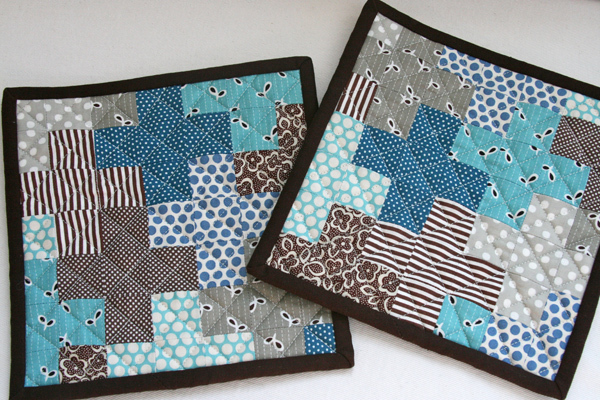 I noticed Kate had favorited several plus quilts, so I went with a tiny plus design on a couple potholders. I used the remaining printed squares to make up a few coordinating napkins. 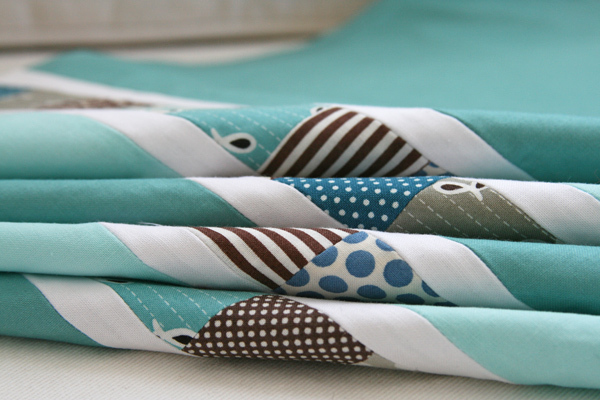 These are loosely based on the napkin tutorial I wrote up for Sew Mama Sew a while back. I hope these will make a nice addition to Kate’s home! This entry was posted in baby, Household Goods and tagged baby cardigan, crochet, handmade, household goods, Napkins, oneflewover, plus blocks, potholders, shades of blue. Bookmark the permalink. And who wouldn’t like the potholders and the napkins? I love those little blue hot pads! If you are looking to take a crochet course this blog http://www.craftyminx.com/ is holding an e-course shortly. Those napkins are great!!! Love the colors! Handmade is the best. Beautiful blues all around. What size are your tiny squares? 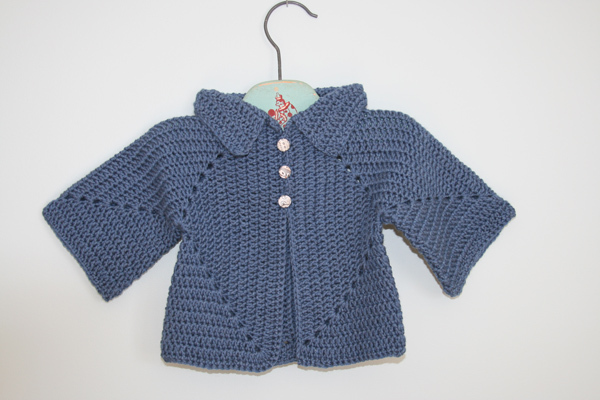 lovely cardigan~i’ve yet to try baby clothes/sweaters. i’ve done crochet for years but anything other than afghans and hats makes me nervous. i’ll have to check out her site/and you tube videos. Love the pot holders! You did a great job on color selection and combination. I’m in need of some new pot holders and need to figure out what to make! What an amazing cardigan. My mother-in-law and grandmother-in-law knit up a few treasures for my first baby. And I can’t wait to put them on my new baby in a few weeks. I admire your thoughtfulness in what you made for Kate. You didn’t just whip something up. You tried to figure out what she liked and THEN whipped something up. 😉 They’re really pretty. That cardigan is lovely! Love that type of dusty blue. I saw it quite a while ago over at Sarah London and then I translated the pattern into Swedish on my blog as so many thought it was so cute. It is very VERY easy to make and so quick too. You should really go ahead and learn the crochet as it is pure joy and yoga for your soul. 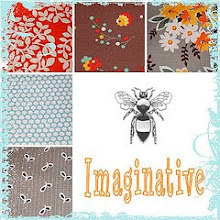 There are so many You Tube videos that can help you and a number of great blogs. Give me a shout if you want some great links, Attic 24 is a great place to start… I have a crochet book that has become my bible of crochet. It is Jan Eatons “The Encyclopedia of Crochet Techniques”. She has great illustrations and step by step instructions. All I have learned about the crochet I have learned through blogs and Internet and now I am teaching the girls at work as well. You easily get “hooked” once you get the hang of it. And once you have your baby interupting you when you least want to crochet is great as you can do it anywhere and anytime for 5 minutes or long stretches. All you need is a hook and some yarn. Good luck! I am excited for you. Those kitchen accessories look great! What a nice gift! I have always been a knitter, but 2 years ago I learned how to crochet using you tube tutorials and buying Crocheting for Dummies (that’s how I learned to knit). You will find it SO easy and SO gratifying! Can’t wait to see what you make! Those are some seriously cute potholders. Love the colors you chose! That tiny handmade cardigan is so precious! The potholders and napking ate beautiful and such a nice “thank you” Hope you have a terrific Tuesday! I’m so thrilled you like the cardi, it was my absolute pleasure to make it for you. 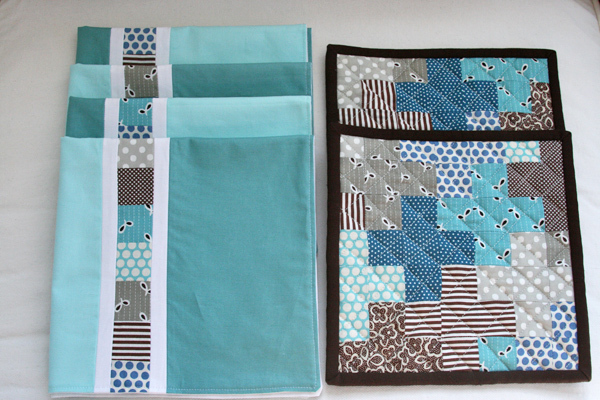 The napkins and potholders are stunning Ashley! Thank you so much, they are perfect and will be much loved here. I am touched that you took the time to create something in a shade that I hold very close to my heart. Blue is my all time fave. I love that you “traded” items…I have given crocheting many attemps and its just not my thing lol – I just can get the hang of it. BUT – I definately could trade some sewing with a freind that crochets! I just noticed the hanger. It made me feel nostalgic as it was the type we had when we were very young. Eons ago. What a lovely swap – any baby would look adorable in that amazing little sweater! Thanks for sharing about this sweet swap – great stuff! I’m the person who sort of accosted you and Morgan in Stitched on Sunday…I recognized you, from your photos here of course, and just blurted out, “You’re Ashley!” Geez, talk about fan girl geekiness. See, the thing is, you truly have been an inspiration to me. 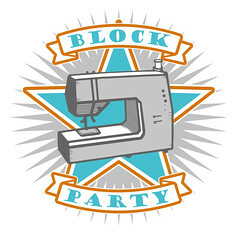 Yours was the first modern quilting blog I read when I started quilting almost a year and a half ago, and honestly, sewing is what’s kept me sane since then. I admire your sense of color and use of space, as well as the gorgeous photographs. So thanks for being incredibly gracious to me the other day. And can I just say, your husband is super sweet! That’s one lucky baby on the way. I love a good cornflour blue! So very sweet! And how very generous! It is such a beautiful sweater. Ashley…that so adorable. I mean,like,i would like one for me in grown-up. Yummmmmmy.